Why is everyone talking about Internal Links? Are they really effective ? Why should you even consider doing it? Let’s find it out in this guide on how internal links will help you. Internal links are just the same as backlinks. Backlinks hyperlink between two different websites. We can say when you are linking to a different website from your website we call it an external link. But when you link within the website, they are known as internal links. A functional strategy for internal linking can really uplift your ranking power because of the below reasons. It helps the search engines in understanding the structure of your site, how your pages interact with one another and which pages are truly significant within the structure of your website. It helps the users in navigating the website and it also helps in keeping users on the website by guiding them to relevant content through links that can be followed. This sends the search engines another thumbs up that your website is great, it provides a good user experience as well. This is why Google is always keen on boosting websites that take internal linking seriously. It’s not only about adding ranking factors to Google’s algorithm, but internal linking actually makes sure that your users have a better experience with your website. But this is just the surface of it. There is an ocean of things that you probably be considering while interlinking your own pages to one another. It might seem difficult in the beginning. But as we discuss more it in this guide, in the end, you’ll learn that internal linking is actually very simple. In order to implement an effective internal linking strategy, you should be first aware of the basics of Internal link building. Now, let’s see why internal linking is so important in SEO. We will now help you to build an effective internal linking strategy for your website. Mapping out everything beforehand becomes even more significant if you own a big website. You can plan it with the help of Excel od Google Spreadsheets. You can also split the mapping into multiple sheets according to your needs. This really helps in case of really big websites. The key to conducting good keyword research is to think of keywords which will help you in finding content which the particular article will be relevant to. Always try experimenting with the variations of your keywords to maximize their utility. Once your keyword research is done, your duty now is to use those set of keywords to search for relevant, older articles in order to link them with your recent articles. This can be accomplished in two methods. The first method is to use your website’s search feature. Once you have identified the articles you want to link from, you have to skim through them to locate the relevant section and map them down along with their corresponding anchor texts. What if your site does not include a search option? Then you can use Google for searching your website, considering the fact that your pages are indexed. Now search for site:yourdomain.com followed by the keyword you’re searching for. After finishing mapping, you can start adding the links. Whenever you post something new, link them to the older topics that you think might be relevant to them. The best time to do this is on the spot, as you write. Thus, you won’t forget what you want to link to. Once you have done it, consider double checking to find some more relevant links. Try using some keywords to identify relevant articles and then link from those articles to your new article. Always remember to send your pages for crawling, after each linking session, irrespective of the size of the post. Crawling tells Google to look into your pages once again to see the modifications made by you and to understand your site better. This whole procedure can be carried out via Google Search Console, in the crawl section. 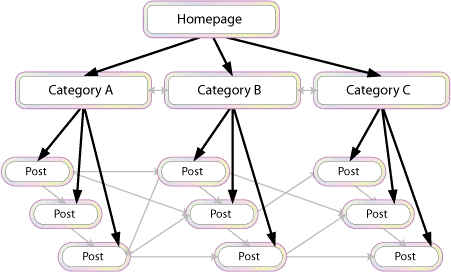 The final step of Correctly implemented internal linking strategy is to measure the results. This measurement can be done by benchmarking your site before and after the implementation of your strategy. Implementation of internal links is not that hard. It might only bring you a headache if you have a million webpages to link to.